In March 2015, the Gulf Cooperation Council, led by Saudi Arabia, launched Operation Decisive Storm in order to bolster the internationally recognized Yemeni government led by President Abd Rabbuh Mansur Hadi. Since then, Houthi rebels within Yemen have launched a significant number of short-range ballistic missiles towards Saudi Arabia and other GCC military installations within and outside of Yemen. Despite major efforts to negate Houthi ballistic missile assets through airstrikes, the tempo of ballistic missile activity does not appear to have abated. This map shows the relative intensity of missile- and missile defense-related activity across the Arabian Gulf which has occurred as part of the ongoing Yemen conflict. Beginning in June 2015, the bulk of these incidents have occurred along the Yemen-Saudi border around the cities of Jizan, Najran, and Khamis Mushait, but Houthi acquisition of longer-range missiles have also permitted attacks as far as Riyadh. Saudi and UAE Patriot missile defenses have intercepted a very high percentage of these launches, greatly limiting damage. Significant activity has also been seen around Al-Mohka and the Straits of Bab-al Mandab, where Houthi-Saleh forces have repeatedly fired antiship cruise missiles at both Emirati and U.S. naval vessels. As of April 4, 2019, there have been 133 publicly reported intercepts of missiles fired from Yemen. This timeline illustrates GCC coalition intercepts of ballistic missiles launched from within Yemen since the operation began. The Saudi coalition is employing PATRIOT ballistic missile defense units to defend against these strikes. Its first intercept of a ballistic missile fired by Yemeni forces occurred in June 2015. Due to the limited reliability of information concerning the ongoing conflict, there may have been other intercepts or ballistic missile strikes not reflected here. The information on this timeline was obtained from AFP, Arab News, Defense News, IHS Jane’s, International Business Times, Kuwait News Agency, Reuters, Saudi Press Agency, Times of Israel, The Guardian, The National, and the Wall Street Journal. PLEASE NOTE: A “strike” as indicated in the timeline does not necessarily equate a failed intercept, as many missile strikes have occurred in areas not protected by missile defense forces. This information is in no way an accurate means to assess the reliability of Patriot or any other air and/or missile defense system. Updated through April 20, 2018. 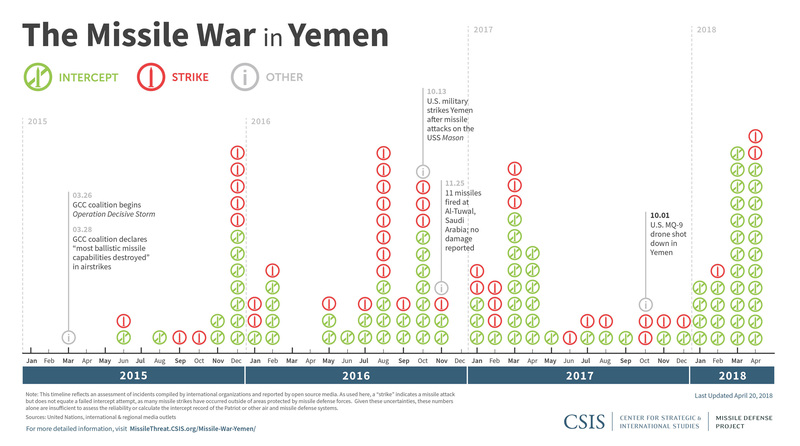 Missile Defense Project, "Interactive: The Missile War in Yemen," Missile Threat, Center for Strategic and International Studies, October 13, 2016, last modified April 4, 2019, https://missilethreat.csis.org/missile-war-yemen/.